Will there be balance after Brexit? As we edge closer and closer to Brexit, uncertainty abounds across the UK business community. Last week, the Confederation of British Industry (CBI) said that UK companies were stepping up their preparations for a no-deal Brexit. There is understandably a lot of concern over the impact that this will have on property prices in the Exeter area, particularly after the stagnation of growth in house prices nationwide in June 2016, shortly after the referendum. Of course, this could have been partly due to the annual trend of prices growing in the spring and levelling off over the summer months. However, it cannot be ignored that the post-summer dip in growth that we are used to actually became a noticeable drop in average property prices towards the end of 2018. Is this a natural market correction after long years of growth, or is the fact that Scotland and other UK nations have seen a steady rise in growth since summer 2017, while England has continued to stagnate, a cause for concern? If we look at the volume of transactions in the housing market, we can get a broader view of market health since the referendum. A lower number of sales than predicted can indicate a lack of certainty in the market – not uncommon around elections, or indeed a referendum. Encouragingly, the referendum didn’t seem to have much of an effect on the volume of property transactions. Certainly, nowhere near the effect that the introduction of the 3% stamp duty surcharge had in April 2016, first creating a boom as investors rushed to purchase buy-to-let properties, before a significant tail-off just after the legislation came into effect. All in all, there are many questions about the immediate future of the housing market, but most experts remain hopeful that the robust nature of this sector will, after a little uncertainty, return to a more predictable place than we feel we are in right now. If you would like any advice about buying or selling property, get in touch with Martin Pratley on 01392 424242 or email ku.oc1556146726.sneh1556146726petst1556146726rebli1556146726g@yel1556146726tarpn1556146726itram1556146726. Are you up to date on HMO regulations for your Exeter property? In recent months, there have been several changes to the law regarding letting Houses of Multiple Occupancy (HMO). A HMO property is described as a house that is occupied by at least three tenants, forming more than one “household”, who share a toilet, bathroom or kitchen facility. As of 1st October 2018, if your property is occupied by five or more persons and the property is a HMO, it falls under mandatory HMO requirements and therefore requires a licence. Previously, the property also needed three-storeys in order to qualify for licencing, but this requirement has now been removed. The new regulations also brought additional requirements relating to minimum room sizes, which apply to all HMO’s in Exeter, whether or not they require a licence. These requirements stipulate minimum floor areas for rooms depending on the age and number of occupants, as well as necessitating that any room in a HMO with a floor area of less than 4.64 square metres is not used as sleeping accommodation. Interestingly, the floor area can only be counted where the ceiling height is at least 1.5 metres – something to bear in mind for older, rural or otherwise less standard buildings. These conditions do not currently apply to HMO’s that had licences issued before 1st October 2018, but the conditions will come into effect on renewal of the licence. If you are in control of or managing a licensable HMO but have not applied for a licence or a temporary exemption, you are committing a criminal offence, so it is important to make sure you know what categories your property falls into and get the right licencing. There are also differing regulations for renting HMO’s compared to single occupancy dwellings, including provision of fire extinguishers depending on the size of the house, and it is wise for landlords to regularly check that their properties remain compliant with new legislation. If you need any help or advice regarding a HMO property, get in touch with our Property Team on 01392 424242 or email ku.oc1556146726.sneh1556146726petst1556146726rebli1556146726g@wal1556146726. January 2019 was an industrious month at Gilbert Stephens Solicitors and we are pleased to present to you the second of our features on the newest members of our team. We are a dynamic firm and we recruit carefully to ensure that we have a strong and dedicated staff in order to meet the demands and exceed the expectations of our clients. 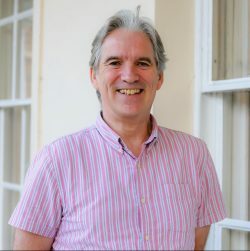 We are very happy to have Jonathan Cave working from our Exeter office as a solicitor in our Private Client department. 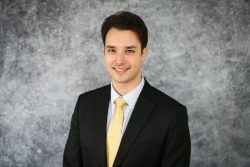 Jonathan comes from Newbury in West Berkshire and trained to be a solicitor in Birmingham. He made the move to Devon for the increased quality of life, and because he liked the prospect of “living in a great place close to the coast”. It is always busy settling into a new job, but Jonathan has taken the time to answer some questions to help us get to know our new starter a little better. What made you choose to progress your career with Gilbert Stephens Solicitors? The firm’s personality appeared to mirror my own, a local firm working in the community. I came from a corporate style firm which was leaving the local community behind and I was unsatisfied in that environment. I am a people person, and Gilbert Stephens is a people-centric firm. What drew you to this career path? Can you tell us about the journey? Originally I did a Business Management degree at Manchester University. I did law modules in that degree, which I found challenging but I really enjoyed. I therefore undertook the Graduate Diploma of Law followed by the Legal Practice Course to become a solicitor. I trained in Birmingham and then qualified in Exeter before moving to Gilbert Stephens. Why did you choose Private Client work? This area of law allows me to help individual clients with their personal affairs. I am passionate about advising people regarding matters that are important to them. I enjoy being able to assist with often difficult issues such as probate administration, drafting Wills or LPAs. If I had to choose another area it might be personal injury law, again because I wish to be able to help individuals with their legal issues. Can you tell us more about what you do day-to-day? As a Private Client solicitor I deal with the administration of estates when people pass away and assist people with life planning such as Wills, Powers of Attorney and Tax planning. I also advise on Trust creation. All of these aspects help individuals navigate the law to put their affairs in order in the best way for their personal wishes and circumstances. Are there aspect of your work that are particularly satisfying or challenging? Helping to reassure clients that we can deal with the difficult aspects of their personal legal issues is paramount, and doing this well is very satisfying. Managing clients’ expectations needs to be done in a very professional manner, as we deal with a varied client base and often people come to us not knowing about what they can achieve. I do my best to accurately lay out what their outcomes might be. Keeping up with changes to the law is challenging sometimes, especially those that relate to Tax. You have to work hard to find the extra time to remain up to date in order to give the best advice. Do you have any advice for others who are considering a career in law? I would suggest gaining as much work experience as possible before committing to study law. Practicing law is very different to studying it, and it is very important to know precisely why you wish to get into law. It is a demanding occupation and some lawyers burn out or change career because the job didn’t live up to their original expectations. Work experience will give you a better idea of what the job involves, so you can go into it with your eyes open. My family and friends, amateur dramatics (I am a member of the Exeter Little Theatre Company and Exeter Musical Society) and keeping fit. I enjoy cycling, running, swimming and using the gym. What are your ambitions for your future in Exeter? My professional ambition is to be a leading member of a law firm, whether that be a partner or Legal director. On a more personal note, I wish to pursue a simple, happy life of contentment, with time to spare for my other interests. Gilbert Stephens would like to wish Jonathan the best of luck in his new role. We are delighted to have Jonathan on board and we look forward to seeing him achieve his ambitions, as well as getting around to bringing in the house plant and photo that he’s planning for his desk. If you would like to know more about careers at Gilbert Stephens, take a look at the Careers page or call our HR Manager, Sarah Judd on 01392 424242. It’s the Law – Tenant Fees are no more! The Tenant Fees Ban is now law, with Royal Assent on the legislation being formally granted this week. The announcement was made after a long and drawn-out process. From 1st June 2019 the Tenant Fees Bill will require landlords and letting agents to stop charging fees to tenants for setting up or renewing their tenancy. The ban excludes statutory and contractual periodic tenancies but will apply to all pre-existing tenancies from 1st June 2020. Landlords and agents can still charge holding deposits, security deposits and rent, though the Bill caps security deposits at five weeks’ worth of rent (if the annual rent is under £50,000) and holding deposits to one week’s rent. Certain fees that are not banned can still be charged e.g. for a change of tenant, fees to compensate early surrender of a tenancy, loss of keys and late payment. Anything over £50 will require evidence of actual costs. Landlords will still be protected by contractual clauses that require tenants to pay fees for the television licence, council tax and utilities, if these are paid by the landlord. However, it is prohibited for landlords to charge tenants any more than the actual billed costs for these services. If a landlord does charge a banned fee after 1st June 2019, a refund must be paid to the tenant within 28 days, or they will face a fine of up to £5,000. If landlords persist in charging these banned fees, it will become a criminal offence and can carry a fine of up to £30,000 and a banning order. If you would like up to date legal advice regarding your tenancy or property, get in touch with our property team on 01392 424242 or email ku.oc1556146726.sneh1556146726petst1556146726rebli1556146726g@wal1556146726. At Gilbert Stephens Solicitors, we are a dynamic firm and we recruit carefully to ensure that we have a strong and dedicated team in order to meet the demands and exceed the expectations of our clients. 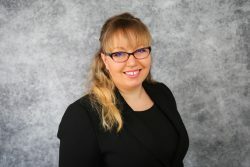 We are very pleased to introduce our latest team member, Conveyancing Executive Katie Bennett. Katie is working towards a Licensed Conveyancer qualification in our Exeter office. 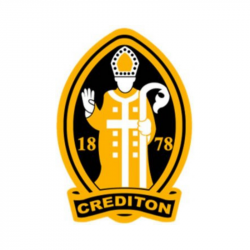 Katie knows the area well, having grown up in Crediton as part of a large and supportive family, and loves Devon enough that she chose to stay and build her career here. 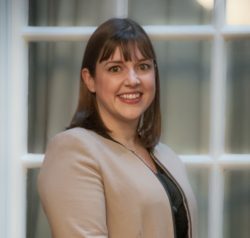 We asked Katie a few questions to get to know what motivates her and what brought her to a career in law. Why did you choose to work at Gilbert Stephens Solicitors? I already knew a few people who worked here who were incredibly happy. It is a really strong firm and I received a great feeling from the staff members I spoke to, both in my interview and throughout the whole process. What drew you to this career path? Can you tell us about the journey? I fell into this career by accident, really. My degree is in Equitation Science, which is sports science within horse sports. For this I studied sports psychology, training of the sports horse and coaching. I was a self-employed groom/trainer specialising in rehabilitating dangerous horses, when a family friend offered me a few hours as her admin assistant working from her cottage. She said I was good at it, I enjoyed it and the career path spiralled from there. Why did you choose this as your specialist area, and if you had to choose another, which would it be? I suppose I didn’t really choose it, it chose me, in a way. I helped with private client and family law in the first firm I worked for and found that I quite enjoyed private client work. So, if I wasn’t doing conveyancing, I would probably be working in wills and probate. Can you explain a bit about what your area of expertise involves and how it helps people? I am an all-round residential conveyancer, although I do get very excited when I get to sink my teeth into an unregistered property. I have worked in new build conveyancing too, but being a bit of a history nut, I love old deeds! I think what really matters in any area of law is your work ethic and the way you are able to manage clients’ expectations and meet their needs. Nothing is the same, each day is different, it’s very hard to get bored in a job like this. Which parts of working in law do you think can be challenging? Probably communicating with clients about things that are very important to them. I make it a rule to try and explain processes to clients, why I am doing certain things etc., as this can help the client to realise that we are on their side, it is our job to look after them. I also find that by helping them to understand the processes, it helps to take away the mystery a little, which reduces potential stress. Every client has different needs and it is so rewarding to complete the transaction with a happy client at the end. Do not expect it to be easy. It’s hard work and can be stressful, but it is also rewarding when your hard work turns into the career you want. And don’t put off until tomorrow anything that you can do today. Too many things! But I still have a horse whom I acquired straight from racing. He’s now fully retired and going blind, but thoroughly loved and spoilt. I also create costumes for competitions, my speciality being gowns, and I’ve even won competitions with some of them. I regularly sing for an event in London that is held in May and October. Do you have any ambitions, professional or personal, that you would like to pursue? Professional – qualify! I am working towards my CLC qualifications at present. I have almost completed my level 4 which will give me a Conveyancing Technician certificate. But I would like to go on to do my Level 6 so that I have the full qualification. Personal – probably to improve my costuming skills and win one of the national or even international competitions! I have qualified for the South West Championships more than once, but as yet have not managed to gain a place in the nationals. What does your desk look like, do you have anything personal on it yet? I have two special mugs that I have brought into work. Both are Disney themed. One has Mrs Potts on and a motivational line from the movie. The other is a tea cup in the shape of her son Chip. I also have my novelty slippers under my desk for when it is cold! Gilbert Stephens would like to wish Katie the best of luck in her work. We are very happy to have her on the team and look forward to seeing her accomplish her goals. or call our HR Manager, Sarah Judd on 01392 424242. We are currently experiencing problems with our phone lines. We have been proud sponsors of Radio Exe’s Breakfast Show with Ben Clark since March 2018. We thoroughly enjoyed listening to his show for many years prior to this, and continue to tune in for his mix of lively conversation, eclectic music and local news. 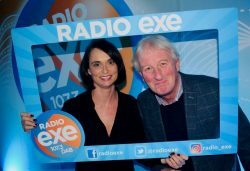 On Wednesday 30th January 2019 our Marketing Manager, Dana Mulligan was pleased to be invited to attend Radio Exe’s Studio Reception. Dana went on a tour of their brand new, purpose-built studios at Matford Business Park, the base from which they broadcast across Exeter, Mid and East Devon. You can tune in to Radio Exe on 107.3 FM and on DAB digital radio. Ben Clark’s Breakfast Show airs Monday to Friday from 6am – 10am. The station launched on Tuesday 10th January 2012, when breakfast presenter Ben Clark played their first track, Billy Joel’s River of Dreams. Seven years on, and shortly after Ben Clark celebrated his 7th Anniversary at the station, they have moved from having just one studio to three, where they can now offer team building, media training and podcast production. These are very exciting times indeed for Radio Exe and we are thrilled to be supporting this local business as it continues to grow. We are very happy to share with you that Gilbert Stephens Solicitors has been shortlisted for the Devon and Somerset Law Society’s Legal Awards 2019. Gilbert Stephens has made the shortlist for two categories, Corporate and Social Responsibility and Law Firm of the Year (11+ Partners). We are exceptionally proud of all our team members from across our six Devon branches. Fee earners and support staff alike have worked together in what we believe is an incredible effort to continue to make Gilbert Stephens what it is. As a firm, we work hard to engage and develop all of our team members, so we can be secure in the knowledge that our solicitors are providing clients with the highest standards of service and have an experienced and dedicated team supporting them. Our commitment to Corporate and Social responsibility is a foundation stone of our firm. We believe that to serve the communities in which we work, we need to not only know about the law, but we also need to know about the people we work with. The charities, groups and initiatives that we have been involved with in the past year have been shining representatives of their communities, and we very much look forward to supporting these causes in the coming year. Gilbert Stephens has been practising in Exeter for over 100 years and more recently in East and Mid Devon. Our team now includes more than 120 expert staff across 6 branches from Sidmouth to Okehampton following mergers over the years with firms with their roots in the local community. It is our continuing goal to help business people protect, manage and grow their enterprises, and provide quality and considered advice to individuals. We interact and collaborate across our departments to ensure that clients benefit from a combination of highly experienced legal experts and new, innovative talent. We are very grateful to be recognised in the shortlist for these awards and are looking forward to meeting our fellow solicitors at the DASLS Annual Dinner on 4th April 2019 at Exeter Cathedral, to celebrate the achievements of our local legal professionals. 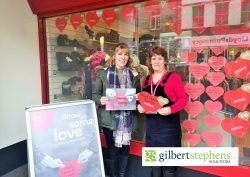 In the run up to Valentine’s Day this February our Okehampton branch is delighted and honoured to be supporting the British Heart Foundation’s ‘Show Some Love’ Appeal. The British Heart Foundation is appealing to all to pop into their local British Heart Foundation shop and make a donation to write and display a loving note, filling the windows with hearts. On Friday 18th January, Linda Jewell from our Okehampton office met with Charlotte, a volunteer at the Okehampton British Heart Foundation Shop. We showed our love by making a donation to the charity to help fund pioneering, life-saving research. The charity’s mission is to better understand how to prevent, diagnose and treat heart and circulatory disease, which is the cause of more than a quarter of all deaths in the UK. Our red heart will be displayed in the shop window until Valentine’s Day, amongst many other hearts showing support for the work of the British Heart Foundation. The window displays heartfelt messages and loving notes dedicated to people affected by the heartbreak caused by heart and circulatory disease. There are also many messages praising the success of the treatments that have allowed parents, grandparents, brothers, sisters, friends and children to stay together. Only through research, that has been funded by donations such as this, can lives be saved and heartbreak beaten. In the run up to the big day on the 14th February, The British Heart Foundation will be filling the windows of their 720 Charity Shops across the nation with red hearts. Last year, in a show of solidarity for the 7 million people fighting heart and circulatory disease in the UK, the British Heart Foundation broke the world record for the longest chain of hearts. They created a chain almost 1.5 miles long, consisting of 17,939 hearts. We are hoping to help them to break the record again this year. If you live in or near Okehampton, do go down the shop and take a look at this fun, and moving, display. We are very proud to be able to support a charity that is so close to all of our hearts, this Valentine’s Day and every day.